Rock Fest Barcelona 2019: Everything You Need To Know! 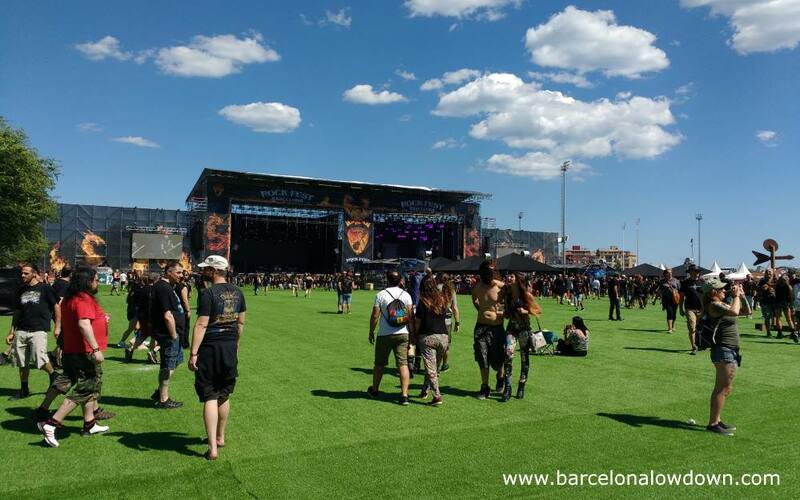 Since its first edition in 2014, Rock Fest Barcelona has quickly established itself as one of Europe’s top rock and metal music festivals. The line-up gets better each year and has included big name acts like Aerosmith, Deep Purple, Ozzy Osbourne, Iron Maiden, Whitesnake and Alice Cooper. In addition to an extensive lineup of acts covering the entire spectrum of hard rock and heavy metal. 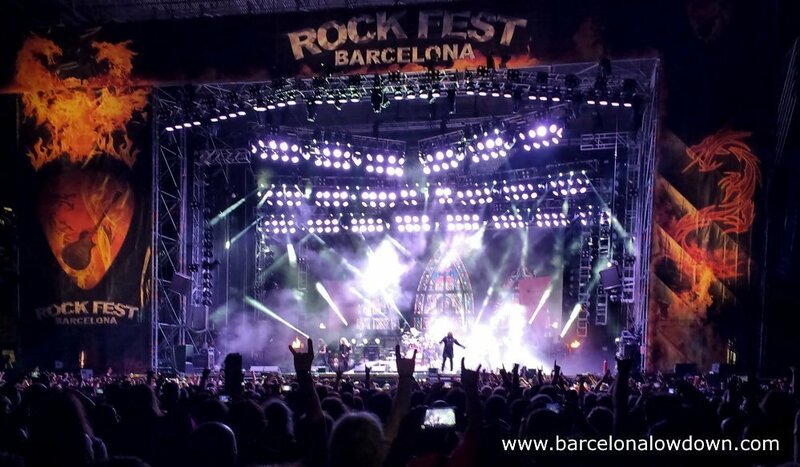 Barcelona Rock Fest also enjoys a privileged location which allows festival-goers to combine a 4 day music festival with a visit to one of Europe’s most vibrant and cosmopolitan cities. 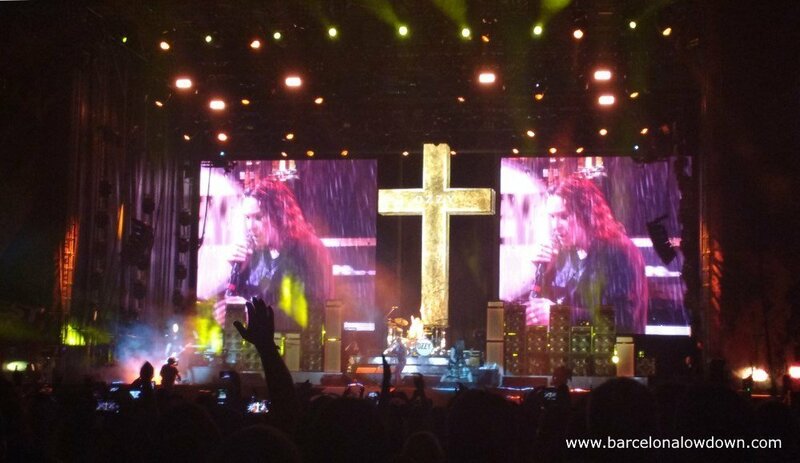 Rock Fest Barcelona is staged in Can Zam Park; an 11 hectare park in Santa Coloma de Gramanet on the outskirts of Barcelona. The festival revolves around two identical main stages set-up side by side (Stage Rock on the left and Stage Fest on the right). It eliminates the classic festival dilemma of having to choose between two bands that are playing at the same time. The bands play almost continuously one after the other throughout the day. Whilst one band is playing on one stage the crew prepare the other stage for the next act. You can choose to whether to move with the crowd from one stage to the other or bag yourself a prime spot right in front of one of the stages and accept a lesser view of the other stage. Large screens either side of the stages help people who are further away follow the action on stage. The sound system is powerful and the sound engineers generally manage to ensure that everything sounds good no matter where you are standing. There is also a third smaller stage at the back of the site called the Rock Tent Stage where lesser known and local bands play. When the bands finish in the Rock Tent stage (at about 3:30 am) DJs from local rock radio stations and night-clubs take over. Most of the acts are on stage for 60 minutes, the headlining bands play for an hour and 45 minutes. Everything is very well organized to ensure each band starts on time. 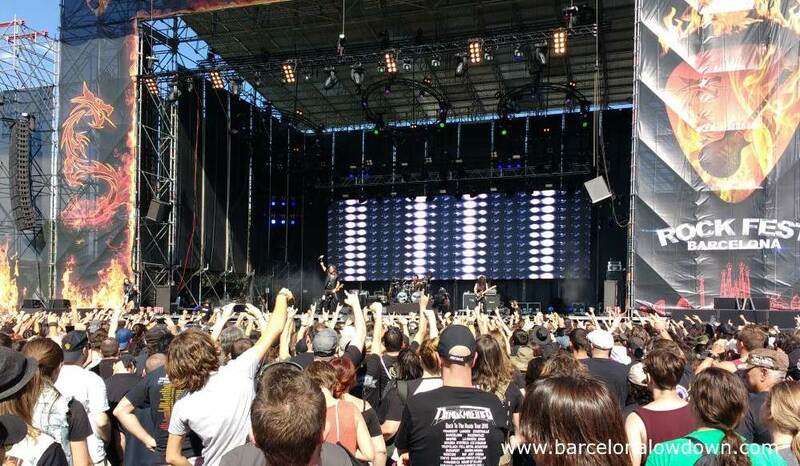 The exact schedule will be published on the Barcelona Rockfest website a few weeks before the event. The best way to ensure that you don’t miss anything is to install the Rock Fest app on your phone. At first glance the app is just a mobile version of the website but it has one very useful function: If you click on a group’s name in the running order they are added to your calendar. You then receive a message reminding you that they are about to play 1 hour before the band goes on stage. If you set an alarm for the first band that you want to see each day, when the alarm sounds you should have enough time to get from the city centre (or the beach) to Can Zam. Please make sure you check your calendar settings to make sure that the alarm is configured correctly. Rockfest Barcelona 2019 will take place on the 4th, 5th, 6th and 7th of July 2019. 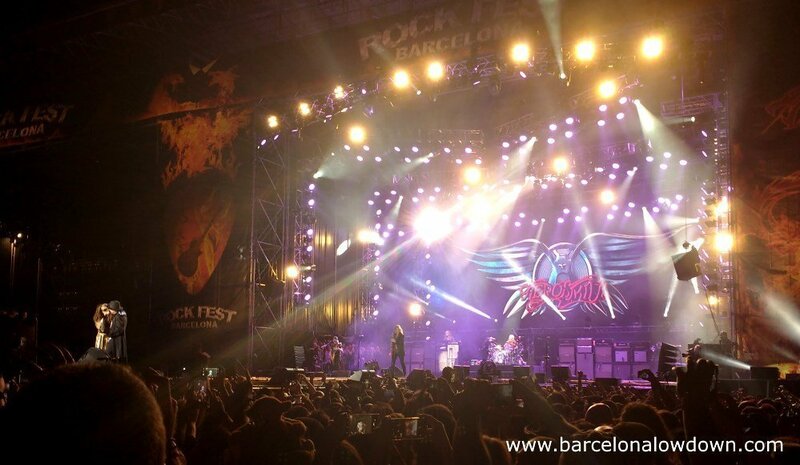 52 bands have been confirmed for Rock Fest Barcelona 2019 including ZZ Top and Def Leppard who will be the headliners on Friday and Sunday night. The 2019 lineup also includes: Michael Schenker Group, Dream Theater, King Diamond, Thunder, Testament, Demons & Wizards, Therion, Sonata Arctica, Avatar, Elvellon, FM, WASP, Venom, Children of Bodom, Hammerfall, Rage XIII featuring Barcelona Rock Orchestra, Dee Snider, Michael Monroe, Napalm Death, Angelus Apatrida, Helix, Deldrac/Legion, Ankhara, Arch Enemy, Europe, Powerwolf, Obús, Combichrist, Boehse Onkelz, UDO, Sacred Reich, Candlemass, King King, Saxon, Sebastian Bach, Gamma Ray, Turulli/ Lione Rhapsody, Cannibal Corpse, Cradle of Filth, Krokus, Entombed AD, Beast in Black, Gun, Los Barones, Def Con Dos, Boikot, Imperial Jade, Raven and Big Mouthers. I’ll update this post as soon as more information is available. Don’t forget to check back soon! Four-day tickets for the festival cost €171.20 and can be purchased online from Ticketmaster and RocknRock or in Barcelona at Carrefour supermarkets, fnac music / book stores and Halcon Viajes travel agents. There are also one day tickets available for Friday and Sunday which cost €130.00 as well as full colour collectors edition tickets which cost €180 for the 4-day pass or €140 for the one day tickets. When purchasing your ticket through Ticketmaster or RocknRock you will receive a voucher which you then exchange for the ticket at the box office near the entrance to the site. Don’t forget to bring your passport when picking up your tickets. Before entering the festival site, one-day tickets and four-day passes are exchanged for wristbands at the entrance to the festival. Once fitted with your wristband you are free to re-enter the festival site as often as you like. Note: You should also keep your ticket with you in case you are asked to show it. Based on previous editions, 4-day pass holders will be able to get wristbands fitted at FNAC stores during the days prior to the event. More information as soon as it becomes available. The autograph signing tent: Where fans get the chance to meet the bands, get autographs and take photos with their idols. The schedule for the autograph signing tent is normally posted on the app and website shortly before the festival. Note; unfortunately the big name acts don’t normally do signing sessions. Photo opportunities: If you don’t manage to see your idols at the autograph tent, there are a giant sized guitar and drums and a “guitar throne” where you can take a selfie with your friends to remember the event. Food trucks and catering: There is a small area with food trucks selling international food. By music festival standards, prices are quite reasonable (€7 to €8 for a bowl of noodles, burger, kebabs, falafel bocadillos etc.) There is a covered area with tables where you can enjoy your food sitting in the shade. Bars: There are two large bars in the middle of the arena where you can grab a cold beer plus mobile beer sellers circulating among the crowd so you don’t have to miss a song to go and get a beer. There is also a beer tent with tables and chairs at the back of the site dubbed the Rock Fest Café. You are not allowed to bring your own food and drink into the site and all festival goers are searched at the entrance. Luckily the drink prices aren’t too high. In 2018 a half litre bottle of water cost €1 and beer cost €3 or €9. Alternatively you can nip off site where you will find enterprising individuals with coolers selling cans of beer for €1.50! Merchandising: There is an official Rock Fest merchandising stall on site selling the ubiquitous festival T shirts and jackets. Outside the festival entrance there’s a small market with about a dozen stalls selling a wide range of band T shirts, jackets, jewellery etc. If you’re feeling sunburnt you can pick up a hat here for about €10. Medical facilities: There is a medical tent with a team of paramedics on site. Toilets: They may not be the most pleasant of places but at least there are plenty of them and toilet queues aren’t usually long. Without going into details, you can expect the seats and floors to be wet. Don’t forget to bring your own toilet paper! Top tip: There are taps with running water where you can wash your hands located next to the food trucks area. 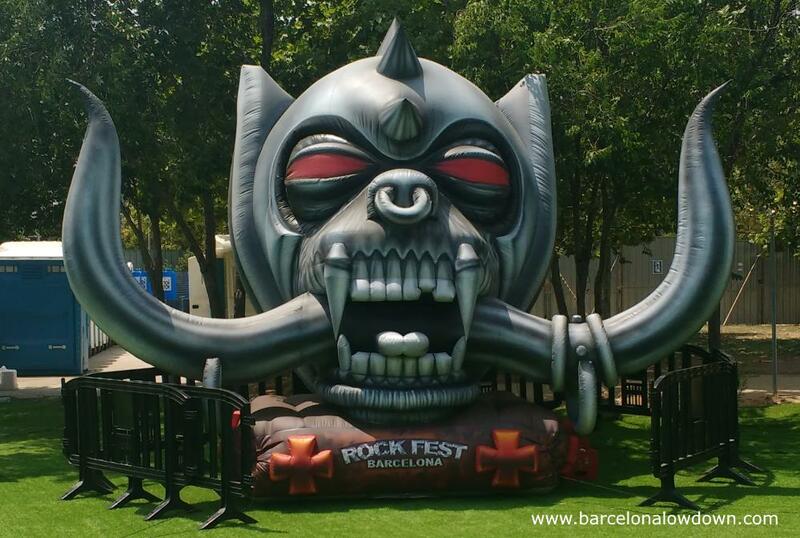 Rock Fest Barcelona takes place in Can Zam Park in Santa Coloma de Gramanet on the outskirts of Barcelona. The festival site is easy to get to from Barcelona city centre and from nearby towns such as Badalona. In addition to the fantastic line-ups, the great thing about Rock Fest is the location and how easy it is to get to. Can Zam has its own stop on Barcelona metro line L9 nord. It takes about 45 minutes to get to the festival site from Barcelona city centre. The metro stop is directly in front of the entrance to the festival. You’ll see the stages and hear the music in the park below you as you leave the station. L9 nord connects to lines L1 and L5 at La Sagrera and I recommend that you chose a hotel near to one of the stops on these lines. The metro runs until 2 am on Friday night, all night long on Saturday night and until midnight on Sunday and weekdays. If you will returning to your hotel after these times, night buses N6, N8 and N8 connect Can Zam to the city centre. There are extra buses laid on during the festival including a special bus which runs from Can Zam to Plaça de les Glories, Plaça de Tetuan and Plaça de Catalunya. It takes 10 minutes to walk from the festival site to the bus stops. At peak times there are queues to get on the buses but it’s well organized and there are plenty of buses so you shouldn’t have to wait long. Alternatively a there is a taxi rank near to the N6 and N8 bus stops but, at peak times, the queues for the taxis are even longer than the queues for the buses! Which transport ticket to buy for Rock Fest Barcelona? For most visitors, it is best to purchase a 1 zone T-10 multi-trip ticket which covers both the metro and the night bus. The T10 costs €10.20 which works out at just over 1 Euro per trip. Tickets can be purchased at metro and train stations, tram stops and at some tobacconists. You can also use this ticket on the train to and from the airport. More information about transport from and to the airport here. Although there are hotels in Santa Coloma de Gramanet and other nearby towns such as Badalona, I think that it makes more sense to stay in Barcelona. When choosing your hotel, try to pick one which is close to a metro stop on either the L1 or L5 metro lines, both of which connect with L9 nord at La Sagrera. I suggest that you choose a hotel near to Plaça de Catalunya. This very central location will allow you to spend your mornings visiting Barcelona’s most emblematic attractions and is just 45 minutes from the festival site. Other good choices would be to stay near to the Sagrada Familia (L5) or in Poblenou near to the Glories metro station (L1). I prefer to use Booking.com for hotel and apartment rentals. You can search hotels and apartments based on price and location. Most of the hotels allow free cancellations up until a few days before your arrival date. If you want to stay as close as possible to the Rock Fest then there’s an Ibis Hotel located right next to Can Zam Park. This gives you the advantage of being just a 10-minute walk from the festival site. Allowing you to maximise your time at the festival and have the opportunity to quickly return to your hotel whenever you feel like it. Unfortunately there will be no camping facilities laid on for Rock Fest Barcelona 2019. If you are on a tight budget or want to live the festival experience to the full 24 hours a day, the festival organizers also set up a camp site with shuttle buses to and from the festival site. The campsite is located in Montmelò, about half an hour from Can Zam. Camping plus transport to and from the festival costs €35 per person for the entire duration, including one day before and one day after the event. Note that fires and naked flames, including stoves and Camping Gaz are not permitted at the campsite. This entry was posted in Entertainment, Festivals & Traditions tagged live music and updated on April 2, 2019 by Richard. I’m from India planning to travel from Dubai. I haven’t booked anything yet but plan to book soon within the next couple of weeks. I’ll be travelling solo so I just wanted to understand is there a forum or group or anything similar to meet up with solo visitors or the like. Am sure once inside the venue, people will be completely into the music so it’d be good to catch up with fans who are travelling from outside Spain or locals. I’ve not tried them myself but there are several international (ie. English speaking) groups on meetup.com for Barcelona. I would like to go for the Def Leppard day on Sunday July 7, 2019, will be flying into Barcelona. What time do the headliners come on and play to? Not knowing the city, I would rather get metro train at about 1115pm. Is this possible? It’s possible but, based on previous years, the main headliners normally go on stage at around 11pm so you would miss most of Def Leppard’s set. Last year the festival was from Thursday to Saturday but in 2017 Aerosmith headlined on the Sunday and (as far as I can remember) finished after midnight. Plus there are other bands who play after the headliners so it’s worth staying on later. It’s really not a problem though because there are extra night buses laid on during the festival including a special bus which runs directly to Plaça de Catalunya and only stops at Plaça de les Glories, Plaça de Tetuan and Plaça de Catalunya. As soon as more information about the bands and schedule for this year’s festival are available I’ll update the article. In the meantime, I suggest you book a hotel near to Plaça de Catalunya. You’ll be pleasantly surprised by how easy it is to get the night bus back to your hotel after the gig. The bus stop is shown on the map in the article. Many thanks for the reply Richard, will get onto booking my tickets. You’re welcome. If you’ve any more questions feel free to ask. Nothing’s been announced yet but based on previous editions I expect that VIP tickets will be available. As soon as I hear anything I’ll update the post with more information. Hi, is it allowed to bring a cell phone or a camera inside? Unfortunately there’s no clear answer to this question on the Rock Fest website or facebook page so the only answer I can give is that I don’t know. Having said that, there are various photo opportunities (a giant guitar and drum kit etc…) set up around the site so I think that it’s safe to assume that photos for personal and non-comercial usea are allowed. Plus there is normally an app for the event which includes the schedule of bands. So I’d say that it’s safe to assume that cellphones are allowed on site. From my experience last year there were plenty of people filming and taking photos with their phones. Plus there was no mention of phones at the security check at the entrance to the site. On the other hand, there is information on the Rock fest website about press passes in which it makes it clear that the number of professional photographers is strictly limited. You do get searched at the entrance so personally speaking, although a compact camera might be OK, I wouldn’t risk taking a DSLR just in case. If you really want to take a camera onsite I suggest you contact the organizers via the email address which apears on their website (see link in the article above). I’ll be at Rock Fest again this year and will try to get a difinitive answer when I’m there. Yesterday afternoon I asked the security staff at the entrance to Rockfest whether cameras were allowed on site and they told me that it was OK. So, although the definition of what constitutes a professional camera isn’t exactly clear, it seems that mobile phones and compact / bridge cameras are allowed whereas DSLR cameras and video cameras aren’t allowed. Hi, I’m in your picture from Friday afternoon. Will you be at Rock Fest again this year? Let me know if you want me to send you a hi-res copy of the photo. Is re-entry allowed on a single day ticket? Can we come watch a couple bands, then leave (go to Barca/Beach), then return for the headliners? Yes, one-day tickets are also exchanged for wrist-bands allowing you to exit and re-enter the festival site. do you know if it is possible to get the wristband on the day before the festival starts? Last year you could get your wristband fitted the day before the festival started at the FNAC music store at the La Maquinista shopping centre. See my reply to ZZ below for more information about this. The Rock Fest organizers haven’t announced whether they will be doing this again this year but I imagine they will. As soon as I have more information I will update the post / comments. Today it has been announced that they will be issueing wristbands at 2 FNAC stores on the 3rd and 4th of July. More information in the article above. By the way, what do you mean with “beer cost €3 or €9”? Are there different sorts of beer or different sizes? You’re welcome and the different beer prices were for different sizes, 0.3l or 1l I think. Just to let you know that they have changed the schedule for fitting wristbands in the FNAC stores in Barcelona. I’ve updated the post. Thanks for your awesome post! This is my first year and I bought colored collectible tickets on RocknRock last year, but only got one confirmation email. No mention of exchange ticket using voucher. So I assume just use that email? Can I exchange before the first day because I want to get closer to the stage and don’t want to waste time exchanging the ticket? Help us if you would. I purchase my tickets locally so have no experience picking up tickets myself. According to the information on the Rockfest website, you should have received a confirmation email. They don’t say anything about vouchers or coupons. It looks like you just need to take the confirmation email and your passport / ID card (DNI) with you to pick up the tickets from the box office at the Rock fest site. Once you’ve got your ticket you then get fitted with a wristband which gives you access to the festival site. Last year, in the days leading up to the festival, there were promotional events staged at different FNAC record stores in Barcelona. At these events, they issued wristbands to people who either had the standard 3-day ticket or (in the case of the coloured collectors’ ticket) brought their confirmation email and passport /DNI with them. Then on the last 2 days before the festival, they issued wristbands throughout the day at selected FNAC stores. One day was the FNAC in the city centre the other was at the La Maquinista shopping centre. They haven’t confirmed that they’ll do the same this year yet but I imagine they will. Thank you for such detailed answer! I’ll keep an eye for the FNAC store thing. You’re welcome. I’ll update the comments as soon as I hear anything. Today the Barcelona Rock Fest organizers have announced that they will be fitting wristbands at 2 FNAC stores in Barcelona on the 3rd and 4th of July. More info about which stores in the blog post above. Thank you! I just saw the info. Will exchange during that time. You’re welcome. Remember that you can only get the wristband fitted in advance if you’ve purchased a full 3 day ticket for Rock Fest. This year I think I’ll do the same. More than anything, so that I’ve got some first hand experience of the process. Just to let you know that today it was announced that the schedule for fitting wristbands at the FNAC stores has been changed around. I’ve already updated the post. Any suggestions on a reasonable hotel to get to the Festival and back? I’m not the best person to give hotel recommendations since I live here in Barcelona and haven’t stayed in a hotel or hostel here for over 15 years. I can only make recommendations based on location and the reviews that they get online. As mentioned in the article and comments section below. I think that it’s best to stay in Barcelona city centre and use public transport to get to the festival site. That way you can make use of your mornings and any additional days that you are here before and after the Rock Fest to enjoy Barcelona. I recommend that you look for a hotel or hostel which is near to Plaça de Catalunya because it’s central and well connected to the festival site. Failing this my second choice would be near to the Glories metro stop. Both are on the L1 metro line and to the night bus route for getting back after the metro stops running (Thursday night the metro stops running at midnight, Friday night the metro runs until 2 am and Saturday night the metro runs non-stop 24 hours until Sunday night). I’ve just had a quick look on Booking and the hotel I suggested to Rodrigo in an earlier comment still has rooms available for the dates of Barcelona Rock Fest. As I said before I haven’t stayed there myself but it gets good reviews on Booking and is located next to Plaça de Catalunya. Many thanks for your reply. It is much appreciated. Are the times of the festival really? Seem very late timings? Please could you confirm. Allella, Mollet, Badalona, Montgat? Castelifdels? Would a taxi be expensive? would a bus / train run these ways? Those are the times from last year, this years timings haven’t been announced yet but I expect that they will be similar. Having said that, last year the headlining acts had played their sets by 1 or 2 am. Sure, you could stay in one of the towns which you have listed although I don’t recommend you stay in Castelldefels because it is the other side of Barcelona. Of the towns you have listed I would probably choose Badalona. A taxi between Badalona and Can Zam would cost about €10 to €15 depending on the time of day. It’s also very easy and fast to get from Badalona to the centre of Barcelona by train (line R1) and metro (L2). Plus Badalona has a nice sandy beach with attractive promenade. You can check the public transport connections to and from Can Zam here and taxi fares here. I hope you are well? Tickets and flights all booked but no hotel yet…Just confusing esp the outer areas? That hotel is in a nice residential area of Barcelona right next to La Rambla del Poblenou where there are plenty of restaurants and bars. It’s also close to the beach. There’s a very good Pizzeria right nearby called Madre Lievito (Neapolitan style pizzas). Although there should be plenty of taxis available at Plaça de Catalunya, you’d be better off catching the N6 night bus direct from Can Zam to Poblenou. There will be signs near to the entrance/exit to the festival which direct you to the nearest stop on the N6 route. The stop nearest your hotel is at the intersection of Carrer de Pujades and Carrer de la Llacuna stop number 2741. Although it’s not in the centre of Barcelona I think the Travelodge would be a good choice for Rockfest. As you say it’s part of a well known hotel chain. By the way, if you do stay there I’d be interested to hear how it works out for you. It would be useful information for other readers. For some reason I cant reply to your post below? But thank you so much for your help. You’re welcome Frank. Have a great week in Barcelona and if you have any more questions feel free to ask. HI Richard, could you please clarify about campsite? My I live there for all fest days, once I’ve bought an entrance ticket? Will they provide me a tent or smth like that, or I need to take care of it by myself? The campsite is located at Montmelò and you can camp there from July 4th to July 8th inclusive. You have to buy a camping ticket which costs €25 per person for the campsite or €35 per person for the campsite plus transport to and from the festival venue in shuttle buses (plus booking fee) for the duration of the festival. The campsite is equipped with toilets, showers, mobile phone charging points and a car park. You have to bring your own tent and sleeping bag etc. Thanks a lot for the wonderful guide you have set up in this website. It is a big help. I am from Malta and Me and we (wife and 2 kids aged 14 and 8) are planning to attend Rockfest Barcelona. I was wondering if you have/know any information about the VIP Travel Package they offer, like which Hotel they use, what options are there for a family of four (2 Adults and 2 Kids (14 & 8)). How many packages I have to buy since I believe that my 8 year old has free entrance to the festival…Are there any other options? Any info you can give is greatly appreciate Richard. Thanks for your comment, that’s a very good question. I had a search of the Rockfest website and Facebook page but couldn’t find the answer either. So in the end I contacted the organizers via the email which appears on the website (see link in the article above). That your 8-year-old doesn’t have to pay to enter the festival and that he can also stay for free with you in the hotel. You just need to pay for 3 full travel packages and they’d put the 4 of you in one family room. The hotel that you will stay at is the Hotel Front Maritim which is a 4-star hotel near Diagonal mar that gets pretty good reviews on Booking. They also told me that they will be laying on hourly minibuses to and from the festival site from midday until 4 am. If you’re interested in that offer you should contact them by mail to confirm and also to arrange the transfer from the airport. I’m not familiar with that hotel but it gets decent reviews and the location is handy for the beach. It’s about half an hour from the centre of Barcelona by public transport. So although not ideal for sightseeing it’s still an OK location if you want to do a bit of tourism while you’re here. It’s quite near to the Rambla del Poblenou where there are some nice bars and restaurants. Doing the maths, the normal ticket costs 186.50 per person whereas the travel package costs 899,00. When you multiply that by 3 that’s a difference of €2137.50. To be honest I think you’d be better off organizing things yourself. I’ve checked on booking and that hotel normally costs €192.60 per night for a double or twin room during July. Alternatively, there are budget hotels in the centre of Barcelona with family rooms for about €200 per night. Transport to and from the festival by public transport for the four of you will work out at €8.16 per day (purchase a T10 travel card and share it between the 4 of you). Before you arrive you should download the responsibility disclaimer form from the rockfest website. You will have to fill it in with your children’s details and hand it in when you arrive at the festival. Your youngest is also eligible for a free Rockfest T-shirt which you have to order online here. Thanks a real lot for this thorough information…./a real help!! We were planning to spend some extra days after the festival venturing around Barcelona so ultimately we would need another Hotel to stay in. The Hotel Maritim is quite expensive to stay in for a week since to book it by myself I have to get 2 rooms (no rooms for 4 it seems), so we are exploring different options. Our main concern is travelling with the kids especially after the concert. I read that there would be quite some “panic” to catch a bus/taxi so I was trying to find a more easy way to get back to the Hotel (hassle free)! Again, thanks a lot, if you can offer any other suggestions (mostly regarding getting back to the hotel hassle free), it would be greatly appreciated. I don’t know where you read that there was panic to get the night bus or taxi. My experience last year was that there were queues but they were well organized. In fact I was surprised by how well the night buses were organized. We caught the bus and I do remember that the queue for taxis seemed to be longer. I can’t remember how long we had to wait exactly but at a guess I would say that it was about half an hour. There were attendants by the bus stops to help you. You just had to tell them where in Barcelona you wanted to go and they told you which queue you should be in. Last year, in addition to the regular night bus routes there was an additional bus laid on which went straight to Plaça de Catalunya and only stopped at Plaça de les Glòries and Plaça de Tetuán. I imagine that they will do the same this year and if I was you I’d try and get a hotel near to one of these locations. Remember that on Saturday night the metro runs all night long and on Friday night it runs until 2am. By the way, since you’re planning to spend a few extra days in Barcelona, I just thought I’d mention that Guns n Roses are playing here on the Sunday before Rock Fest. Not sure whether it’s sold out yet, I bought our tickets as soon as they went on sale last year. First of all thanks a lot for your help. Thanks to your suggestion we booked the Hotel/Concert Tickets/Airline and we’re all set to go!! Thanks a lot. If I may, can I ask your advice about airport transfer. Due to flight constraints we will be landing at Barcelona Girona Airport at about 16:00. Our Hotel is situated at Cerdanyola del Vallès. What is the best means of transport to get there in the shortest time possible. By bus/train it takes more than 2 hours and we would prefer a shorter time. I checked some Taxis options….the standard transfer are quite costly via taxi but then I found welcomepickups and gettransfer which offer quite a cheap price for the same trip. Are these reliable ‘taxis’ to use for a family of four? As always any suggestions you offer are GREATLY appreciated. Thanks a lot for the help you already offered. Glad to hear that you’ve got everything sorted. I guess that you are planning to fly with Ryanair right? Funnily enough, my family and I have just got back from 4 days in Malta and flew Ryanair from BCN. Living in Barcelona and visiting Malta, the early morning flight out and late return worked well for maximizing our time. I can see that it wouldn’t be ideal if coming the other way though. The direct bus from Girona airport to Barcelona city centre takes about an hour and a half so 2 hours to Cerdanyola del Vallés seems about right to me. I’ve no experience with either of the transfer companies you mentioned so the only thing that I can suggest is that you check reviews online before booking. Also, you can check the quotes that you have received with the price given by this website which should give a good idea of the price of catching a cab from the taxi rank at the airport without booking. I’ve not caught a taxi from Girona airport but from BCN the prices quoted are pretty accurate. Thanks areal lot for all the help. I will take heed of all the valuable suggestions you offered and finalize the planning of this trip. Next time you are in Malta I’ll be glad to meet up and have a couple of beers together!! CHEERS Mate!! You’re welcome, and thanks for the offer of a beer. I’m from Brazil and I’m planning on going to the festival and it looks like Ibis Hotel near the festival is with no more vacancy, I believe most of the bands crew are to be at the Ibis Hotel. Anyways, I’m looking for a hotel at Barcelona center as I do’t like staying at Hostels, any good hotel would you recommend? I saw at booking.com the NH Barcelona La Maquinista just 10 mins from the festival but it’s quite expensive. I’m also thinking of to rent a car with GPS as I think it would be better for me to locate the festival and also the hotel and a visit to the Camp Nou Stadium. Looking forward to some help from you. As you say, it looks like the Ibis is already fully booked for those dates. I’m surprised that it’s booked up so quickly this year but as you say it’s probably due to the fact that musicians and staff who work at the festival will be staying there. Last year, out of curiosity, I checked the availability on Booking while Rockfest was taking place and there were still rooms available for all but the last day. If I were you and wanted to stay right at the festival site I’d book a room in the centre which allows free cancellation and then check again nearer to the dates and see if any rooms have become available (due to cancellation or whatever). Obviously, since I live here in Barcelona I haven’t stayed in any hotels here. When I first arrived I stayed in a hostal for a few weeks but that was more than 15 years ago. So I can only make suggestions based on location and reviews or comments that I have read online. Since you don’t mention what your budget is I have had a quick search on Booking and found this hotel which has single rooms available for just €80 per night including breakfast and gets good reviews. It’s in the centre of Barcelona, good for sightseeing and close to a metro stop on the red line. It will take about 45 minutes to get from the hotel to the festival site at Can Zam by metro (the metro stop is right in front of the entrance to Rock fest. If you’ll be staying in Barcelona I don’t think that it makes sense to rent a car to get to the festival. Firstly because you will have to spend about €25 per night per night for a carpark in the centre of Barcelona. Secondly, there is a free carpark laid on at Rock fest but (based on previous years) it fills up very early so you might end up having to search for a public car park somewhere near the festival site. Thanks a lot for the tips and this looks like a very nice hotel to stay, I’ll sure book on this one. I’m just worried about the car thing you mentioned, so this means that the hotel doesn’t have a carpark and I would have to spend EUR 25,00 per night? And also a possible car park near the festival I was already with that on mind. I was thinking before of not renting a car and go by metro but since the festival will end after midnight, I’m not quite sure I’ll be able to get a metro back to the hotel or maybe get a wrong one and get lost in the Barcelona centre hahaha… that’s why in my mind I think of going by car with GPS which I saw on rentalcars.com it’s not so expensive. I’m planning on to take EUR 300,00 for the 5 days but I’m now thinking of to raise to a EUR 400,00 for the 5 days. Do you think this will be enough considering food, beverage, carparking and a visit to the Camp Nou? I have done some research today over the parking stuff you mentioned and also looked out for the nearby of the hotel in Google Maps and I would prefer a lot to rent a car then to get the metro and I saw that there is a parking lot just close to the hotel “Parking Saba Plaza Cataluña” where a daily parking there is EUR 25,00 but I found out this site parclick where I can save a spot on the parking for 6 days for only EUR 80,00 … I believe this site is secure, do you know if that works well? So, my overall question would be if EUR 400,00 would be enough for the 6 days of my trip (04/Jul to 09/Jul) considering food, beverage, carparking at the Festival, gasoline for the car and a visit to the Camp Nou? If you have any other tips to share, I would highly appreciate. I hadn’t heard of that website before but, as you say, €80 for 5 nights parking in central Barcelona is a good price. Can Zam is about 12km from Plaça de Catalunya, petrol costs about €1.35 per litre. Assuming that you will be picking up the car at the airport and using it to get to your hotel, I imagine you’ll probably end up spending around €20 to €25 on petrol. Check the hire company’s fuel policy before you return the car because most of them want you to return the car full and will charge you a higher price if they have to re-fill it. As I mentioned before there will be a free car park laid on by the Barcelona Rock Fest organizers but it normally fills up early. If it’s full then there’s a car park next to the Ibis hotel which charges €25 per day for the 3 days of the Rock Fest (Parking Cubics Promoparc). The only free car park I know of in the area is at the La Maquinista shopping centre which is a 10-minute taxi ride or 30-minute walk from the festival site! If you do end up parking at La Maquinista make sure you park in the open air car park because the multi-storey car park closes at night! Don’t leave anything inside the car when you park it or at least if you leave something make sure it’s in the boot and out of sight. One recommendation that I always give people who will be visiting Barcelona is to eat your main meal at lunchtime. Most restaurants serve a lunchtime daily menu which costs between €10 and €15 and includes 3 courses and a drink. Expect to pay about €5 more at the weekend. In your case, I’d suggest you eat lunch in Barcelona before you go to the festival and then you’ll just need to spend €15 for some noodles or a burger from one of the food-trucks and a couple of drinks in the evening. Plus you should allow about €5 for soft drinks to keep you hydrated throughout the day. Since you’ll be driving I’m assuming that you’re not planning on drinking much beer! The evenings that you’re not at the festival you can expect to spend about €25 per person for a meal in a restaurant. Or you could have tapas and beer in a bar for about €15. You can save money by avoiding the bars and restaurants on La Rambla who cater principally for tourists. The Camp Nou Experience costs €25 and the hotel mentioned above includes breakfast. If you want to save money on food and drink there’s a Carrefour supermarket near to your hotel as well as the Boqueria food market. Remember that you’re not allowed to take food or drink into the Rockfest site and they do search bags at the entrance. Thanks a lot once again for the help you sending me Richard. This week I’ll be finishing to book everything and I’m highly considering to not rent the car and take out the metro and night buses. Maybe as you mentioned before, the Ibis at Santa Coloma might end up showing one spot and then I can cancel the one at Barcelona centre and get the Ibis which would be much better for me. Yes there will be one day tickets available although they aren’t on sale yet and the prices haven’t been announced. Last year the one day ticket cost about half the price of the three day ticket. As soon as I know more I’ll update the post. One day tickets for Rockfest Barcelona are now available, full information in the post above.